A well designed wireless ergonomic mouse that takes an unconventional approach. All of the features you would expect from a high end mouse in a particularly compact package. I used to believe that no mouse could possibly surpass the design brilliance of the Logitech MX Wireless Mouse. Simply put, the Logitech is perfect. It fits my hand well. It’s got long-lasting lithium-ion rechargeable batteries. It works over bluetooth. It’s just… fantastic as mice go. But, today I’m going to talk about a mouse that might actually give the Logitech a run for its money, the Swiftpoint GT Wireless Ergonomic Mobile Mouse. Like the Logitech, the Swiftpoint is a departure from nearly anything else you’ll find on the market. Unlike the Logitech, though, this thing is a radical design departure, unlike anything I’ve seen before. It’s… small. Really small. In fact, it is mean to mimic the feel of a pen rather than the feel of a mouse. It is also heavily influenced by the gestures you would typically make when using a touch pad, but manages to accommodate them in a unique and tactile way. So how does it work? Well, the Swiftpoint GT actually supports two distinct modes of use. In the standard mode, it works just like a regular mouse. You move it around your desk or tracking surface and it moves the cursor. Nothing fancy there. In the “touch” mode, however, the mouse really comes alive. By tilting the mouse to the side, it mimics a finger on a touch screen monitor. You can flick the mouse and perform other gestures to move between screens or scroll through webpages. In short, it is an intuitive one-stop shop solution for those of us who want to use a mouse for precision work, but also enjoy using gesture inputs for efficiency. What’s more, the most recent versions of the Swiftpoint GT work on both Mac and PC. Initially, I really only saw the usefulness on Windows. There are a number of tablet PC devices running windows 10 that are essentially a macbook and iPad in one. For those devices, having a Swiftpoint GT is more obviously useful because it allows you to quickly go between the two input paradigms seamlessly. However, on a Macbook, the lack of a touchscreen would initially seem to undercut the Swiftpoint GT”s most useful feature. Not so. I use gestures such as the two-finger scroll and four-finger swipe between desktops all the time. With the latest version of the Swiftpoint GT, it is possible to use mouse to input the most common magic trackpad gestures on OSX. In short, it becomes the best of both worlds on both Mac and PC. There are a number of other useful aspects to its design as well. In particular, because it is so small, you can use it as a mouse on particularly small tracking surfaces. Whats more, for such a small device, it actually tracks particularly well. It goes without saying that this mouse is incredibly portable to boot. It uses rechargable lithium-ion batteries and connects via bluetooth, which is to be expected for a mouse in this price range. So where does this thing cut corners? Well, as one might expect with such a radical design, the Swiftpoint GT might still be working out a few bugs. Particularly on OSX, it seems that the Swiftpoint GT is not quite there yet. Many folks have mentioned problems with the bluetooth connection, and support for all touchpad gestures is still a feature that is in ongoing development. Unique pen-based design – small, portable and ergonomic. One of the most innovative designs on the market. Gesture support – This is the killer feature of the Swiftpoint GT. Gives you the precision of a mouse with the efficiency of a touchpad. Lithium Ion Batteries – Rechargeable batteries are not only good for the environment, but convenient as well. Ongoing Development – As a new product, it seems that some of the features are not 100% ready for primetime, and a number of users have reported bugs, particularly with bluetooth connectivity on OSX. Price Point – The high price point may dissuade some potential buyers from giving the Swiftpoint GT a shot. The Swiftpoint GT Wireless Ergonomic Mouse is in a class of its own. 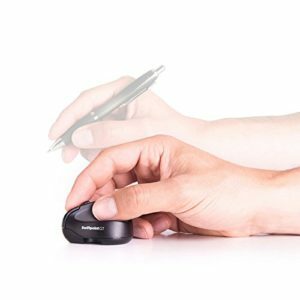 With a revolutionary design and a clear value-add for those of us that like to use gestures for efficiency, this mouse is, without a doubt, worth a shot for those of us that are willing to step a bit outside the box. Final Verdict: Compact, cutting edge wireless mouse for those that are willing to take a leap of faith.